Times of the Islands – Let the Sun Shine . . .
Let the Sun Shine . . .
Fortis TCI Limited offers innovative solar energy program to customers. By Kathy Borsuk ~ Photos Courtesy FortisTCI Ltd. I have heard the Turks & Caicos called the “Isles of Perpetual June,” referring to the consistently sunny days, kept comfortable by steady tradewinds. The bright tropical sun is one of the country’s many attractions to visitors, especially the large numbers arriving during the blustery winter/spring months of North America and Europe. Now, the sun’s rays have a purpose beyond tanning pale bodies. The country’s electricity providers, FortisTCI Ltd., recently introduced two new programs that will fan the flames of the country’s smoldering “green energy” movement. Located 22º north of the equator, the length of day in Turks & Caicos varies from 10 hours and 49 minutes (December 21) to 13 hours and 27 minutes (June 21). The median cloud cover is 54% (partly cloudy) and does not vary substantially over the course of the year. (Source: weatherspark.com). According to the Energy Transition Initiative*, TCI has substantial solar resources (5.7 kilowatt-hours/square meter) each day with more than 350 days of strong sunshine and strong average winds. With this in mind, many wondered when FortisTCI Ltd., the Islands’ sole electricity provider, would begin “harvesting” the sunshine to lower the high cost of energy and reliance on imported fossil fuel. Imported diesel fuel supplies the grid electricity for TCI, with an aggregate generating capacity of approximately 82 megawatts to meet a combined peak demand of 37.6 MW in 2015. The TCI has a multi-layered electricity rate design. Residential customers pay 26 cents per kilowatt-hour, below the Caribbean regional average of 33 cents per kWh. 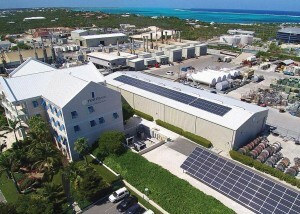 The solar photovoltaic system at the FortisTCI headquarters in Providenciales. The first step was to contract developer Urban Green Energy (UGE) and local partner Urban Green Environmental (UGE) in 2014 to design and build a 35.25 kW solar photovoltaic system on the FortisTCI headquarters in Providenciales. The installation consists of 141 Hyundai mono crystalline PV modules on a Schlepper roof-mount system. According to Jay Bennett, UGE president and project manager, the system is currently the largest commercial solar installation in the Turks & Caicos. The pilot project could serve as a model for solar development in the Caribbean. When properly installed, solar panels directly convert the sun’s rays into direct current (DC) electricity. These panels are made up of photovoltaic (PV) cells and are placed on a roof in direct sunlight for optimal use. When the sunlight hits a solar cell, its photons are converted into electrons of DC electricity that flow through an inverter where they are converted into alternating current (AC) power. This is the electricity which can then be synchronized into the electric grid. As the FortisTCI project was being developed, the primary principles were safety, service quality/reliability, no cost subsidies, and no increased rates resulting from introducing renewable energy. In addition to working out tax policies and grid connection issues, Jay Bennett says one of the key requirements for renewable energy installations is that they survive exposure to hurricane conditions. The FortisTCI project was designed to survive sustained winds of 150 mph with gusts up to 200 mph. “Because it is such a new area for the Turks & Caicos, we spent a lot of time working with the planning department to establish appropriate guidelines,” Bennett adds. With the unqualified success of the pilot program, FortisTCI was ready to expand the options to their customer base. In November 2015, they launched two exciting new solar energy programs. This option allows customers who own or will purchase solar photovoltaic systems up to 10 kW (residential) or 60kW (commercial) to interconnect with the FortisTCI grid. (Note: This is the only way for owners of solar systems to interconnect to the grid. Non-participating systems must be stand-alone or completely isolated from the FortisTCI electricity grid.) The billing arrangement is termed “buy-all, sell-all” which gives customers a credit on their monthly electricity bill equivalent to the avoided cost of generation. This option seems like the win-win, “no brainer” to me. FortisTCI covers the installation, maintenance, and ownership of a rooftop solar photovoltaic system that is interconnected with the grid. So in essence, customers are “renting” their rooftop space to the utility, receiving a monthly credit based on the size of their roof. According to FortisTCI Director of Customer Service Aisha LaPorte, a typical 1,000 sq. ft. roof space with a 10 kW system could lower your bill by as much as $100 per month! It almost sounds too good to be true. There are stipulations, however. The customer must have title to the property on which the system is to be installed. FortisTCI engineers will assess the roof to ensure it is strong and stable enough to hold the solar PV system. They will also inspect any existing system for the C.O.R.E. program to make sure it is up to code. Fortis is currently taking applications for both programs and starting the initial installations, anticipating an 8 to 12 week time frame before your new system is up and running. The goal? FortisTCI plans to invest $10 million in this project over the next five years, with a “moving target” of 600 to 1,000 kW of installed capacity by the end of the year, rising to 5% of retail power sales by 2020. Meanwhile, FortisTCI also offers the SmartConnect program, which includes In-Home Energy Audits to help residents become more energy efficient at home. Trained technicians will evaluate your dwelling and send you recommendations for change, with follow-up power monitoring over the next six months. This service is free until August 31, 2016. An extensive list of energy conservation tips is also available. What else does the future hold? Most agree that wind and solar both will feature strongly in the renewable energy strategy of the Turks & Caicos. Don Forsyth says FortisTCI is starting a two-year data capture study on wind power generation and is seeking government approval to move forward. With TCI said to have the highest reported greenhouse gas emissions in the region, the reduction in fuel imports seen from energy efficiency and renewable energy implementation can do nothing but good for the country and our precious planet. For more information, visit www.fortistci.com.